An 83-year-old Caucasian woman with decreasing vision for 5 years was referred for a macular mass in the left eye (OS). She was a known hypertensive with no other significant systemic complaints. Surgical history included two previous breast biopsies, both of which were negative. On ocular examination, best-corrected visual acuity was 20/20 in the right eye (OD) and 20/50 OS. Intraocular pressures were normal. She was pseudophakic with bilateral peripheral iridotomies. There was an elevated orange choroidal lesion in the macula (white arrow) and a small choroidal nevus inferiorly OS (black arrow) (a). There was no overlying drusen, hemorrhage, lipid exudation, or edema. 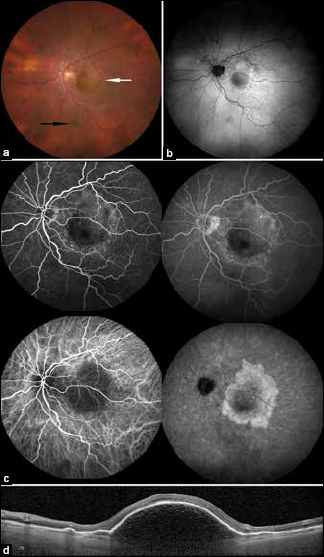 Photodynamic therapy to the choroidal hemangioma. Computed tomography scan of the chest and abdomen to look for a primary tumor. Perform fluorescein and indocyanine green angiography (FA, ICGA) for further investigation. The lesion was 2.65 mm thick and acoustically solid on ultrasonography. Fundus autofluorescence demonstrated central hypoautofluorescence surrounded by a halo of hyperautofluorescence (b). Fluorescein angiography showed early central hypofluorescence surrounded by stippled hyperfluorescence and late ring-like staining. ICGA revealed early hypocyanescence and late geographic hypercyanescence (c). Optical coherence tomography (OCT) showed a large subfoveal pigment epithelial detachment (PED) and smaller surrounding PEDs without subretinal fluid (d). Heterogenous hyperreflective signals were present along the inner roof of the large PED, and the choroid was flat [Figure 1]. A fibrovascular PED associated with age-related macular degeneration (ARMD) was diagnosed and intravitreal bevacizumab was advised. Large fibrovascular PED secondary to ARMD OS. A fibrovascular PED represents Type 1 choroidal neovascular membrane (CNVM) separating the retinal pigment epithelium (RPE) from Bruch's membrane, frequently secondary to ARMD. The dome-shaped mass was yellow–orange in color, clinically mimicking choroidal hemangioma, metastasis, or amelanotic melanoma. PEDs account for 5% of pseudomelanomas. Melanoma often reveals “double circulation” on FA and hemangioma typically shows early hypercyanescence with late washout on ICGA. PEDs demonstrate stippled hyperfluorescence and late staining on FA. Variably delineated late hypercyanescence on ICGA suggests regressed CNVM. OCT localizes fibrovascular PEDs to the sub-RPE space. Therefore, multimodal imaging was essential for accurate diagnosis. Support provided in part by the Eye Tumor Research Foundation, Philadelphia, PA (CLS), an unrestricted grant from Research to Prevent Blindness, Inc. (LAD), and the Heed Ophthalmic Foundation (LAD). The funders had no role in the design and conduct of the study, in the collection, analysis, and interpretation of the data, and in the preparation, review, or approval of the manuscript. Carol L. Shields, MD has had full access to all the data in the study and takes responsibility for the integrity of the data and accuracy of the data analysis. Mrejen S, Sarraf D, Mukkamala SK, Freund KB. Multimodal imaging of pigment epithelial detachment, A guide to evaluation. Retina 2013;1735-62. Shields JA, Mashayekhi A, Ra S, Shields CL. Pseudomelanomas of the posterior uveal tract: The 2006 Taylor R. Smith Lecture. Retina 2005;25:767-71. Shields JA, Shields CL. Vascular tumours and malformations of the uvea. In Shields JA, Shields CL Intraocular Tumors. An Alas and Textbook. 3rd ed. Philadelphia, PA: Lippincott Walters Kluwer; 2016. P 247-8.